Just as I was finding myself in a dark chocolate malaise Choxie was dropped on my lap. It's brazen merger of milk chocolate, espresso, toffee and almonds gave my taste buds a welcome reprieve from the world of dark chocolate. 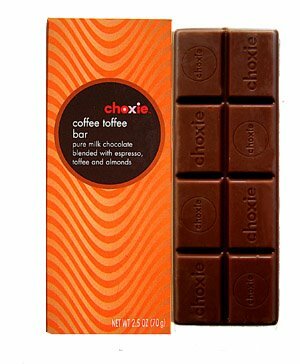 You can tell Choxie has bite by its "tiger-esque" tan and brown striped box. Besides the amazingly gratifying taste what surprised me the most was that this audacious confection is the product of Target. Nevertheless, if you pick one of these up, buy two, you’ll thank me later.